Still on track for 2017. 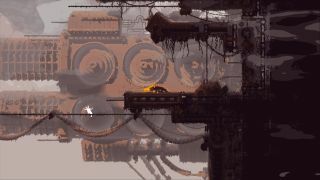 Now that Owlboy has finally come out, Rain World is the long-in-development indie sidescroller to watch, and its latest trailer re-affirms that, yes, Videocult's game of hunting and stealth set in the ruins of an ancient civilization looks as ambitious and beautiful as ever. The trailer was released to coincide with the PlayStation Experience at the weekend, and it's interesting to read the comments by PlayStation fans introduced to Rain World for the very first time. ("So you're an Albino Ferret trying to survive in some alien world?") The game's ambition doesn't really come across in the video, but the Steam page has a neat summary of why many us are so interested. "Inspired by the simplicity and aesthetics of 16-bit classics, this survival platformer requires fast-paced sneaking, both upon your own prey and past the jaws of hungry predators. Each ravenous foe in your path will be cunning, vicious and always on the hunt – eager to sink their teeth into you, or even each other. As a small, soft slugcat you must to rely on stealth and wit rather than force: learn the ecosystem and turn their strengths to your advantage. Maybe then you can survive… Rain World!" There's no firm release date yet, so we'll have to make do with a vague "2017".